Eamon Dolan/Houghton Mifflin Harcourt, 9780544279773, 272pp. A leading authority draws on new research to explain why the adolescent years are so developmentally crucial, and what we must do to raise happier, more successful kids. LAURENCE STEINBERG, Ph.D. is one of the world’s leading experts on adolescence. He is Distinguished University Professor of Psychology at Temple University, in Philadelphia. Dr. Steinberg is the author of more than 350 articles and essays on development during the teenage years, and the author or editor of fourteen books, including You and Your Adolescent,The 10 Basic Principles of Good Parenting,Beyond the Classroom, and Adolescence, the leading college textbook on the subject. He has been a featured guest on numerous television programs, including CBS Morning News, Today, Good Morning America, 20/20, Dateline, PBS News Hour, and The Oprah Winfrey Show, and is a frequent consultant on adolescence for print and electronic media, including the New York Times and NPR. He has also written for the New York Times, Wall Street Journal, Washington Post, USA Today, and Psychology Today. A graduate of Vassar College and Cornell University, Dr. Steinberg is a Fellow of the American Academy of Arts and Sciences, the American Psychological Association, and the Association for Psychological Science. 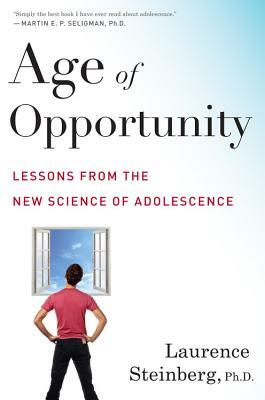 "Steinberg explains how 'abnormal' adolescent behavior is actually 'normal.' This book belongs on the shelf of every parent, teacher, youth worker, counselor, judge— heck, anyone interested in pre-teens and teenagers." —David Walsh, Ph.D., author of Why Do They Act That Way?